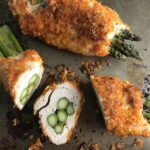 4-Ingredient DORITO CHICKEN and Asparagus Rolls! Yes, Dorito, my friend. The Doritos add a salty and crispy crust to the outside of the chicken with a hint of cheesy flavor. 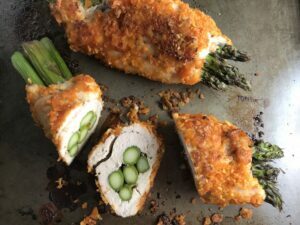 The Chicken stays moist and juicy rolled up and you get this fresh bite of Spring in the center with the Asparagus. Now, I’m not gonna go as far as to claim that this recipe is healthy, but c’mon it has Asparagus rolled inside so it can’t be that bad, right? 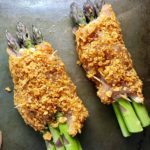 And what better way to get your kids to try asparagus than to coat it in Doritos! I grew up with a family that ate healthy meals but we always had treats and snacks in the pantry and I’m not talking organic granola bars with chia seeds and flax seed. I’m talking Twinkies and Ding Dongs and Potato Chips and Cheetoes. And of course, Doritos! Today, I try to stick with more natural and whole food snack food options for my kids, but I still buy Doritos every so often. I mean, I’m not a monster😎. I love how excited they get when I do buy these ‘special treats’ since it’s not around all the time. Turn your Doritos into crumbs by either placing them in a bag and smashing them with a rolling pin or placing them in a food processor and pulsing them. Store them in a plastic bag. 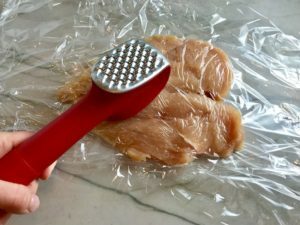 Prepare the chicken breasts by first opening them with your knife and then pounding them flat with a meat tenderizer or bottom of bowl. Note, you want to be sure you have full breasts, not pre-sliced thin, as they may not be big enough to roll. Opening up and pounding out your own ensures they are large enough. Cut the woody ends off the asparagus, but wait to wash them until you are ready to cook. That’s it! 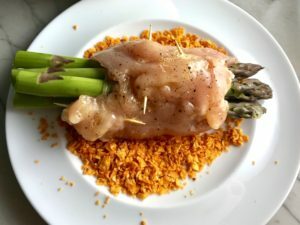 place the Doritos, the Chicken, the Asparagus, plus one unbroken egg on a sheet pan or large bowl in the fridge until the night you are ready to cook. On the night you’re ready to cook, pull your KIT out from the fridge! Preheat oven to 400, then spray the bottom of a large sheet pan with extra virgin olive oil. Rinse the asparagus and set aside. 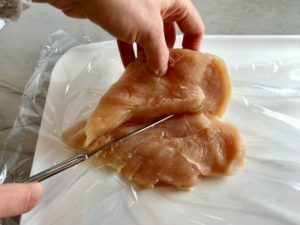 Lay the chicken breasts out on a flat surface. Season both sides with a sprinkle of salt and pepper. Then place 4-5 spears of asparagus on the chicken off to one side as you will be rolling starting from that side. Roll the asparagus up in the chicken and then secure the end with 3-4 toothpicks. Beat an egg in a large bowl (big enough to fit your chicken rolls). In a second large bowl or on a plate, place the crushed Doritos. Take a chicken roll and coat it in the egg. 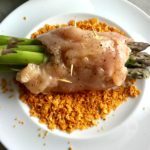 Shake the excess egg off, then roll it in the Doritos to full coat the chicken (you do not need to coat the asparagus). Then place the chicken on the oiled sheet pan. Do this for each of the 4 chicken breasts. Once all are on the sheet pan, spray or brush with Extra Virgin Olive Oil, then bake in the 400 degree oven for 15 minutes on the center rack. Flip the Chicken over and then bake for a second 15 minutes. After a total of 30 minutes in the oven, remove the chicken and let rest for 5 minutes. Slice for the beautiful presentation and serve over salad or rice or quinoa. ENJOY! 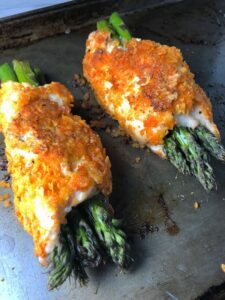 4-Ingredient DORITO CHICKEN and Asparagus Rolls! Yes, Doritos, my friend. The Doritos add a salty and crispy crust to the outside of the chicken with a hint of cheesy flavor. 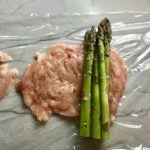 The Chicken stays moist and juicy rolled up and you get this fresh bite of Spring in the center with the Asparagus. Turn your Doritos into crumbs by either placing them in a bag and smashing them with a rolling pin or placing them in a food processor and pulsing them. You are looking for a panko breadcrumb-like size and texture. Store them in a plastic bag. Note, you want to be sure you have full breasts, not pre-sliced thin, as they may not be big enough to roll. Opening up and pounding out your own ensures they are large enough. Next place another piece of plastic wrap over the top of the chicken breasts. 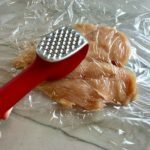 Using a meat tenderizer or the bottom of a large bowl, gently pound our the chicken breasts to get them even and as flat and thin as possible without pounding through creating holes. 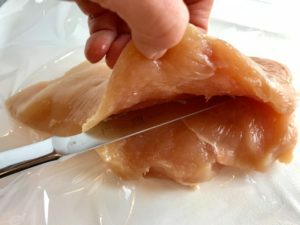 Place the chicken in a large plastic storage bag. That's it! 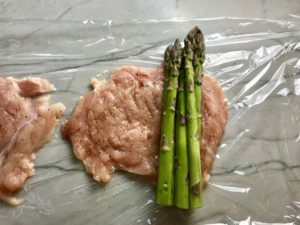 place the Doritos, the Chicken, the Asparagus, plus one unbroken egg on a sheet pan or large bowl in the fridge until the night you are ready to cook. Preheat the oven to 400 degrees F. Spray a sheet pan with Extra Virgin Olive Oil or brush on 1 tsp. Beat an egg in a large bowl (big enough to fit your chicken rolls). In a second large bowl or on a plate, place the crushed Doritos. Take a chicken roll and coat it in the egg. 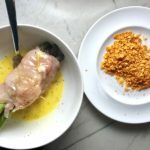 Shake the excess egg off, then roll it in the Doritos to full coat the chicken (you do not need to coat the asparagus). Then place the chicken on the oiled sheet pan. After a total of 30 minutes in the oven, remove the chicken and let rest for 5 minutes. Slice for the beautiful presentation and serve over salad or rice or quinoa. ENJOY! 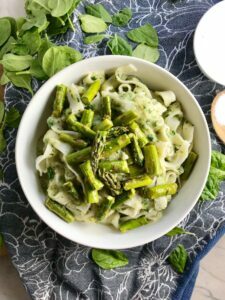 Green Cauliflower Cream Fettuccine is bright and creamy and perfect for Spring. 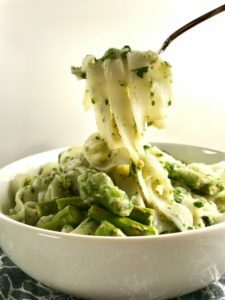 With Spinach blended into the sauce and bites of Asparagus, you get the creaminess and the texture all in one fabulous dish. Cauliflower Cream Sauce is truly a chameleon. It can take on any flavor that you add to it. 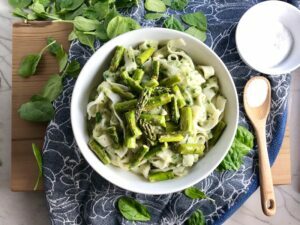 With the green veggies, this Green Cauliflower Cream Fettuccine recipe takes a comforting cream sauce to the next level. Gluten-Free, Dairy-Free, Vegetarian. Another great way to use Cauliflower is to make Cauliflower Rice or Cauliflower Steaks! If you haven’t tried these little wonders, you really should. 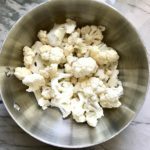 Cauliflower is a chameleon and can REALLY taste like rice! 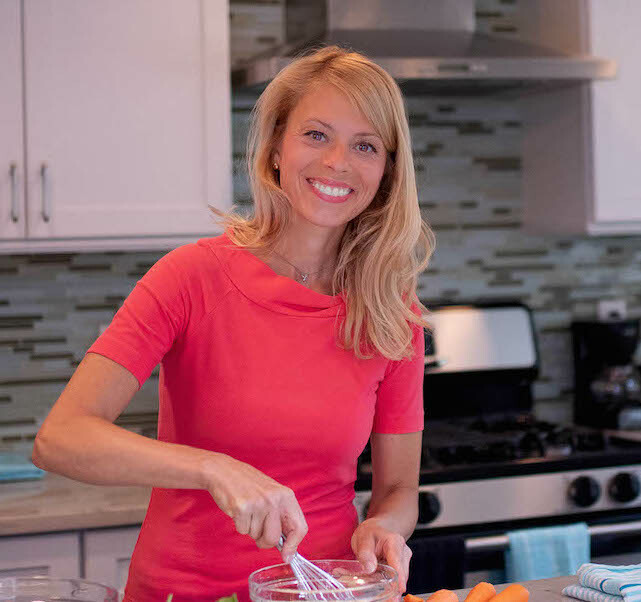 My youngest daughter, Alexa, is currently trying a diary-free diet to see if that helps to lessen flare-ups related to a dry skin condition, Keratosis Pilaris. She has absolutely embraced this dairy-free experiment and I am so incredibly proud of her. 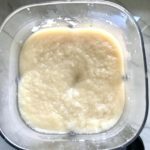 I have wanted to create a cauliflower cream sauce recipe for some time now, but helping Alexa to find dairy-free recipes was what propelled me into action! 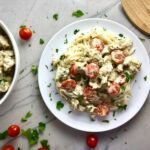 Cauliflower Cream Sauce is an incredible way to get the creaminess you love in a cream sauce without any dairy at all! The recipe begins with about 3 cups of cauliflower florets, which are steamed in a large pot with some water. 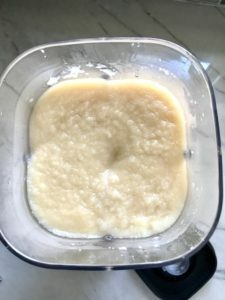 You then puree the cauliflower in a blender with some water and Vegetable Base. I love to use Better Than Bouillon; Vegetable Base (8 oz) which has a rich, deep flavor, keeps so well in the refrigerator, and is so versatile, I can add it to a variety of soups, sauces, and marinades. Then you saute garlic and spinach. 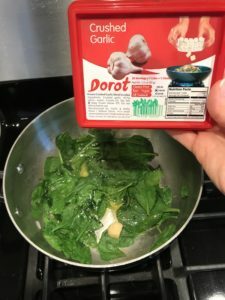 Here, I have recently been introduced to Dorot Gardens Frozen Garlic Cubes. I LOVE these! I prefer to use fresh garlic whenever possible, but let’s face it, there are times (perhaps often🙄) when we are just so busy that we forget to buy fresh garlic and that should not stop us from cooking a flavorful dish! 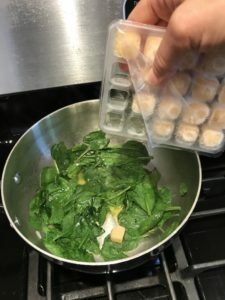 Dorot Gardens gives you frozen pre-portioned garlic cubes that you keep in the freezer, so you don’t have to worry about it going bad and it’s always there as a wonderful back up. 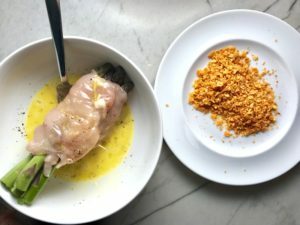 I tried it in this recipe and I’m telling you, it tasted just like fresh garlic that I had just minced. 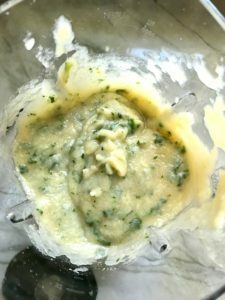 Once the spinach is wilted, add it with the garlic to the cauliflower cream and pulse the blender to incorporate it into the sauce. Pulse so that it blends, but not completely purees. You still want to see the spinach bits and pieces. 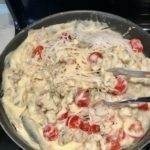 For the ‘Fettuccini’ in this recipe, I LOVE to use Wide Rice Noodles, such as Taste Of Thai Noodle Rice gluten free Extra wide, 16 oz . 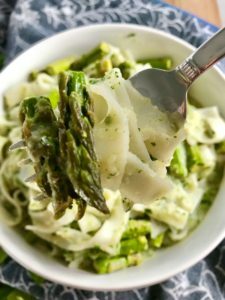 After making the noodles and straining them, as well as roasting the asparagus, add the noodles back to the pot and pour over the Green Cauliflower Cream Sauce. Last mix in the asparagus, saving some to put on top once plated. 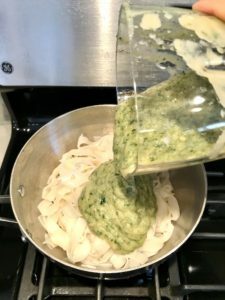 I hope you try this wonderful Green Cauliflower Cream Fettuccine!! 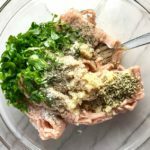 This Italian Turkey Sausage Cauli-Cream Noodles recipe is a healthier version of the flavors we love. 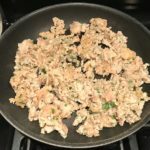 Homemade Italian Sausage with ground white meat turkey and a dairy-free cream sauce made from cauliflower. Then a burst of fresh flavor from cherry tomatoes. Gluten-Free Rice noodles are fine like angel air and really soak up all of the creamy deliciousness in every bite. 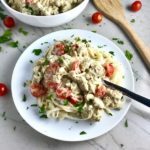 This a guilt-free, creamy, decadent, delicious pasta dish. Gluten-Free. Dairy-Free. 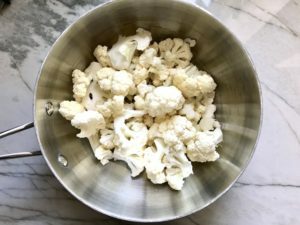 Place the cauliflower florets in a medium sauce pot and fill with water to about 1/3 as high as the florets. Cover and turn the stove to medium heat. Water should come up to a boil and cook with cover on for 8-10 minutes. Turn off heat and let sit for another few minutes. Test the florets with a fork to make sure they are fall-apart tender. Then strain out the water and transfer to a blender. Add 1 cup chicken broth and blend until smooth. Add salt & pepper to taste. Note: leave the center of the lip off and cover with a towel to let steam escape and avoid a cauli-explosion. Pour into a storage container. Chop 4 Tbls Parsley. Place 1 tbls in a small baggie for garnish. The remaining 3 tbls will go into the turkey sausage. Mince 2 cloves garlic. Add the Ground Turkey to a large mixing bowl. 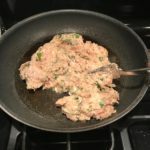 To the turkey, add the minced garlic, 3 Tbls of the chopped parsley (save 1 tbls for garnish), 1 tsp of fennel seed, 1 tsp Salt, 1 tsp fresh ground pepper. Mix to combine. 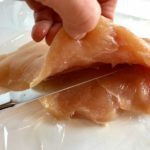 Place in a gallon bag for storing in the fridge. Make the Rice Noodles in a very large pot for lots of room, as rice noodles are starchy and can stick together if the pot is too small. When you add the noodles to the boiling water, stir frequently until they start to soften to ensure the noodles do not stick. Strain the noodles and rinse really good to wash away excess starch. Store in a large baggie. Rinse the cherry tomatoes and cut each in half. Set aside until later. To a preheated pan, add 1 tbls extra virgin olive oil. Add the Italian Sausage Turkey mixture. Break apart the meat and let it sear. Continue to break it up into bite-size pieces and let it brown on all sides, about 8 minutes total cooking time. 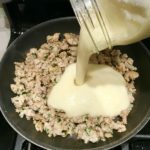 Pour the cauliflower cream sauce over the cooked turkey sausage in the pan and stir to combine heat up the sauce again. Add the halved cherry tomatoes and stir to combine and heat. Note, the tomatoes will only lightly cook which keeps the bright, fresh, bursting flavor in this dish! Place the cooked noodles back in a strainer and rinse with warm water. Once the noodles have regained life and are pliable, add them to the sauce in the skillet. Stir to combine. Plate the pasta, sprinkle with remaining chopped parsley. Enjoy! !